My first ever Cannonball! I’m super proud of this, as I’ve been doing CBR for a few years (off and on) and have never managed more than a half-Cannonball before. I’m going to try to achieve this goal again next year. Now on to my final proper review of the year. 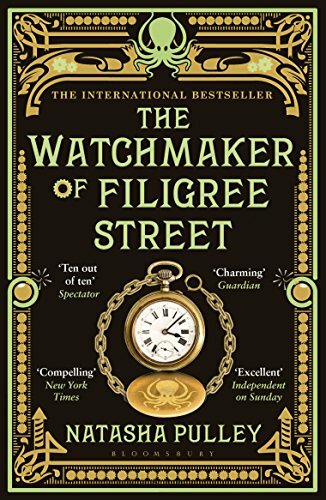 Natasha Pulley’s The Watchmaker of Filigree Street is a lovely, lovely book. It sits at the crossover between historical fiction and fantasy, but just barely steps over the line into the fantastical. It is probably not fantastical enough to satisfy a fantasy geek, but it is apparently enough to annoy some amazon reviewers! It reminded me of Erin Morgenstern’s The Night Circus in several ways: the way the fantasy imbued the story but did not necessarily take over it or swallow up the historical details, and the sweetness of the love story. I don’t think Watchmaker is as good as Night Circus, but it is definitely an atmospheric read. It centers around three main characters whose stories become entwined, told from the perspective of Thaniel Steepleton, a telegraph monitor with the home office, and from that of Grace Carrow, one of the few women studying a scientific degree at Oxford. These two become entangled with the eponymous watchmaker, a Japanese man named Keita Mori, whose clockwork creations are so clever as to verge on the fantastical–and who is also clairvoyant. Thaniel is saved by one of Keita’s watches from a terrorist bomb that destroys the Home Office. He goes to survey the watchmaker to try to find evidence of his involvement in the bombings (I think?) but grows to like the man more and more. I have one actual problem with the book: it is a bit of a slow read. Sometimes a slow, lyrical read is great. I found that actually I stopped reading this one and came back to it when I was more in the mood, and that was definitely for the best. But at the beginning, I struggled with some of the setup, like why/how Thaniel starts spying on Keita Mori in the first place. This Catholic Classicist bristled immediately at these lines. And then laughed. When I got over my initial reaction (that Grace is The Worst, an opinion I maintained throughout the book with actual good reason) I realized how brilliant this characterization is. Grace is a woman who thinks that anyone who doesn’t contribute to her world is useless. She dismisses anyone she doesn’t agree with or sympathize with. We see this over and over in her interactions with her family and those around her. Grace is admirable for her determination, but this determination also serves as a way of blinding her to what truly matters. I hate Grace, but I admire Pulley’s ability to make her so hateable. Luckily Thaniel is a more sympathetic character, and it is he we spend most time with. He is a bit awkward and bumbling, but he has a good heart and wants to help those around him. He sends most of his money to his widowed sister and her sons. He becomes embroiled in the terrorism plot and its aftermath against his will, but never loses sight of his moral compass. He isn’t perfect either (he doesn’t often stand up for himself, for one thing) but he is a good counterpart to Grace, and although the melding of their storylines is a bit abrupt, it does make sense. One thing that I suspect is a big perk for a lot of Cannonball readers (spoilers ahead that I will try to white out):This book features a truly lovely LGBTQ+ romance. It is sweet and shy and utterly delightful and I am so pleased that the book went in this direction. Share the post "In the nick of time, my first ever CANNONBALL!" Congratulations! Sounds like a great book to finish on, and I am super impressed with your spoiler-hiding trick! CONGRATULATIONS!! I’ll be adding this to my TBR list. Great recommendation. It’s one I haven’t heard a lot of buzz about but that a friend recommended to me. Glad to pass on the interest! Happy Cannonball! I It really is the best feeling. Anything in the vein of The Night Circus goes on my to read list, but thanks for the appropriate level of expectation. Nice work on your first Cannonball!